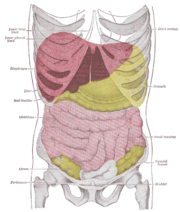 The liver (red) is a wedge-shaped organ positioned in the upper part of the human abdomen. The liver is a large vertebrate organ positioned in the upper region of the abdominal cavity, below the diaphragm. Since most compounds absorbed by the intestine pass through the liver, it functions as a control center that integrates various metabolic processes, regulating the traffic of fuel molecules (such as, carbohydrates, fats, and proteins) used in energy metabolism. Hepatocytes (liver cells) comprise about 60 percent of liver tissue; they participate in numerous metabolic and secretory functions. A second class of cells, called Kupffer cells, line the vascular networks; their primary role is to recycle red blood cells that are no longer functional. The liver is also shot through with bile ducts and blood vessels. In the vertebrate body, the liver is the largest gland (i.e., a cell, tissue, or organ that excretes a chemical substance). One of its important glandular functions is the secretion of bile, an alkaline compound that aids in the digestion of lipids. Additional roles include the synthesis of blood-clotting factors (for example, blood proteins found in plasma); removal of waste and other toxic materials; and destruction of worn-out red blood cells. The liver can be considered an altruistic organ—its metabolic activities essential for providing fuel to the brain, muscle, and other peripheral organs, often at the expense of its own energetic needs (Stryer 1994). Among its numerous metabolic roles are several related to carbohydrate metabolism. The liver contributes to the regulation of blood glucose levels, storing excess glucose as glycogen, and releasing glucose into the bloodstream when levels decrease. Notably, despite the high concentration of glycogen in liver cells, the liver does not use glucose derived from glycogen to meet most of its own energy needs; instead, it utilizes the keto acids derived from the breakdown of amino acids. The liver cells, therefore, perform the glucose storage and release primarily for the benefit of other organs. The liver also plays a role in aspects of lipid metabolism, such as cholesterol synthesis. The liver of a sheep, showing (1) right lobe, (2) left lobe, (3) caudate lobe, and (4) quadrate lobe. Blood supply to the liver comes from two distinct sources, the (5) hepatic artery and the portal vein. Also depicted are (6) hepatic lymph nodes and (7) the gall bladder, where bile may be stored after it passes through the liver. The liver is the heaviest organ in the body: An adult human liver normally weighs between 1.7-3.0 kilograms (3.5-6.5 pounds). Soft, pinkish-brown, and boomerang-shaped, the liver is the second largest organ in the body (after the skin), and the largest internal organ. Located on the right side of the upper abdomen below the diaphragm, the liver lies to the right of the stomach and makes a kind of bed for the gallbladder (which stores bile). The liver is connected to two distinct blood supplies. The hepatic artery, which contributes about 25 percent of blood flow to the liver, conveys oxygenated blood to the liver. The other 60-80 percent comes from the portal vein, which transports nutrient-filled blood from the stomach and the intestines. At any given moment, the liver contains about one pint of blood or approximately 13 percent of the body's total blood supply. The bile produced in the liver is collected in bile canaliculi, which merge to form bile ducts. Bile can either drain directly into the duodenum via the common bile duct, or it can be temporarily stored in the gallbladder via the cystic duct. The central area where the common bile duct, portal vein, and hepatic artery enter the liver is called the hilum or porta hepatis. The duct, vein, and artery divide into left and right branches, and the portions of the liver supplied by these branches constitute the functional left and right lobes. The liver has the capacity to interconvert fuel molecules; for example, it can convert certain amino acids, and some other molecules like pyruvate and lactate, into glucose (a process called gluconeogenesis). While the nutrient molecule glucose is abundant in the circulatory system, the liver can store it in the form of glycogen; when the available supply of glucose in the bloodstream diminishes, the liver returns glucose to the blood. Thus, the liver plays a crucial role in the regulation of blood glucose levels. The liver also performs several roles in lipid metabolism, including cholesterol synthesis and the production of triglycerides (fats). The liver produces and excretes bile, a greenish liquid that acts to some extent as a detergent, helping to emulsify fats (increasing surface area to help enzyme action), and thus aiding in their absorption in the small intestine. Bile also helps in the absorption of certain fat-soluble vitamins, notably vitamins A,D, E, and K.
The synthesis of plasma proteins from circulating amino acids. The liver produces the coagulation factors I (fibrinogen), II (prothrombin), V, VII, IX, X and XI, as well as protein C, protein S and antithrombin. The breakdown of hemoglobin from senescent (worn-out) red blood cells, creating metabolites that are added to bile as the pigments bilirubin and biliverdin. The breakdown of toxic substances and most medicinal products in a process called drug metabolism. The conversion of ammonia to urea. Storage of a multitude of substances, including glucose (in the form of glycogen), vitamin B12, iron, and copper. Immunological effects. The reticuloendothelial system of the liver contains many immunologically active cells, acting as a "sieve" for antigens carried to the liver via the portal system. In the first trimester fetus, the liver is the main site of red blood cell production. The fetal liver releases some blood stem cells that migrate to the fetal thymus, so initially the lymphocytes, called T-cells, are created from fetal liver stem cells. By the 32nd week of gestation, the bone marrow has almost completely taken over this task. Many diseases of the liver are accompanied by jaundice, a yellowing of the eyes and skin caused by increased levels of bilirubin in the system. The bilirubin accumulates from the breakup of the hemoglobin present in defunct red blood cells; during normal function, the liver removes bilirubin from the blood and excretes it through bile. Hepatitis, or inflammation of the liver, is caused mainly by a range of viruses, but may also be triggered by some poisons, autoimmunity, or hereditary conditions. Cirrhosis refers to the formation of fibrous scar tissue in the liver, which replaces dead liver cells, leading to a progressive loss of liver function. The death of the liver cells can be caused by a number of factors, including viral hepatitis, alcoholism, or contact with other liver-toxic chemicals. Gilbert's syndrome, a genetic disorder of bilirubin metabolism, found in about 5 percent of the population. Glycogen storage disease type II, in which the build-up of glycogen causes progressive muscle weakness (myopathy) throughout the body and affects various body tissues, particularly in the heart, skeletal muscles, liver and nervous system. The liver's regenerative ability is predominantly due to the hepatocytes' ability to act as unipotential stem cells (i.e. a single hepatocyte can divide into two daughter cells). There is also some evidence of bipotential stem cells, called oval cells, which can differentiate into either hepatocytes or cholangiocytes (cells that line the bile ducts). Liver regeneration is also at the basis of modern transplant techniques. Liver allografts for transplant usually come from non-living donors who have died from fatal brain injury. However, living donor liver transplantation is a technique in which a portion of a living person's liver is removed and used to replace the entire liver of the recipient. This operation was first performed in 1989 for pediatric liver transplantation. Only 20 percent of an adult's liver is needed to serve as a liver allograft for an infant or small child. More recently, adult-to-adult liver transplantation has been performed using the donor's right hepatic lobe, which comprises 60 percent of the liver. If the operation goes well, both the donor and recipient end up with normal liver function. However, this procedure is more controversial, as it entails performing a much larger operation on the donor, and indeed there have been at least 2 confirmed donor deaths out of the first several hundred cases. A recent publication has addressed the problem of donor mortality, as at least 14 cases have been claimed (Bramstedt 2006). Mammalian and avian livers may be part of the human omnivore's diet: Culinary products throughout the world include liver pâté, Leberwurst, Braunschweiger, foie gras, chopped liver, liver and onions, leverpostej, and liver sashimi. Because the liver can be a site of vitamin storage before vitamins are released into the bloodstream, animal livers are often rich in nutrients such as iron and Vitamin A. Cod liver oil, for example, is commonly used as a nutritional supplement. However, very high doses of Vitamin A can be toxic; Antarctic explorers Douglas Mawson and Xavier Mertz were both poisoned, the latter fatally, from eating husky liver. In the United States, the USDA specifies 3000 μg per day as a tolerable upper limit. However, acute vitamin A poisoning is not likely to result from liver consumption, since it is present in a less toxic form than in many dietary supplements (Myhre 2003). Bramstedt, K. 2006. Living liver donor mortality: Where do we stand? Am J Gastroenterol 101(4): 755-9. Crane, G., ed. 2007. êp-aomai. The Perseus Digital Library, Tufts University. Retrieved August 28, 2007. KMLE Medical Dictionary. 2007. Definition of liver. LMLE Medical Dictionary. Retrieved February 16, 2007. Myhre, A. M. et al. 2003. Water-miscible, emulsified, and solid forms of retinol supplements are more toxic than oil-based preparations. Am J Clinical Nutrition 78: 1152. Digestive organs: (1) esophagus, (2) throratic diaphragm, (3) stomach, (4) liver, (5) gallbladder, (6) duodenum, (7) pancreas, and (8) spleen. The liver, and associated veins, of a 24- or 25-day-old human embryo, as seen from the ventral surface. Portal triad, showing artery, vein, and bile duct. Frontal view from Gray's Anatomy (1918). Back view from Gray's Anatomy (1918). American Association for the Study of Liver Diseases (AASLD). This page was last modified on 24 July 2018, at 13:38.